BMM has a vision for sustainable facilities in the long term, and recycling and repurposing an existing building is the greenest way to do it. As construction is one of the most emissive and energy intensive industries, the design and building of energy efficient and waste minimising infrastructure is vital for ecological sustainability. However, brand new energy efficient zero carbon buildings are still composed of raw materials, of which undergo energy intensive manufacturing, delivery, and extractive processes. This is the concept of embodied energy, and existing buildings already have a store of the energy throughout their lifecycles. The importance of addressing the embodied energy cost as well as the efficiency of the building’s operation is clear when considering that the ratio of operational energy to embodied energy is only 1:24 for typical medium-sized Australian office buildings. This means that it would take 24 years for a newly built office to use more energy through operating than it has embodied. 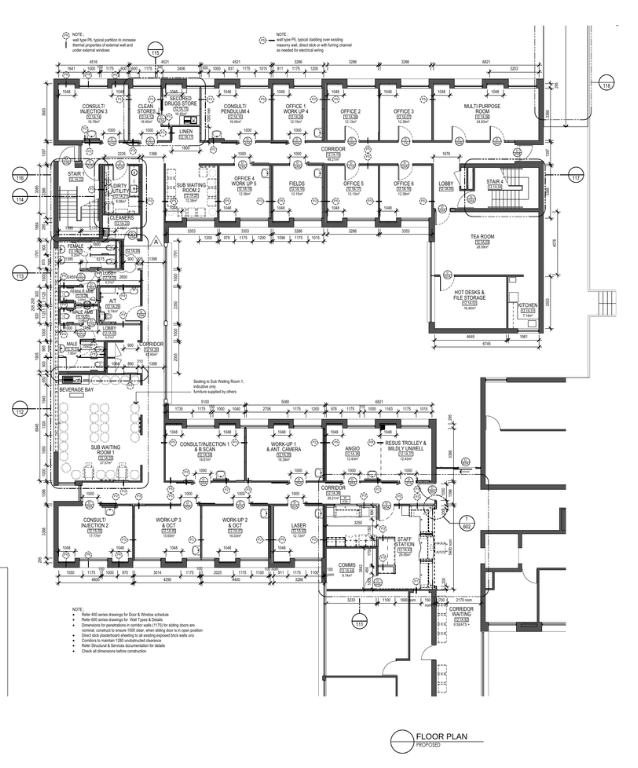 Outpatient Clinic floor plan 2015, around 700sqm. This ratio is dependent on the design, fuel, materials, equipment, climate, and operational efficiency of the building. For new energy efficient buildings, embodied energy is an even larger proportion of the energy consumption over its lifecycle, and it would take up to 65 years to recover the energy cost. For the outpatient clinic, due to the outpatient operating hours it can be compared closely to the statistic for a medium-sized office. When existing buildings are repurposed, there is significantly less energy used in the process than if it were to be demolished and completely rebuilt using new materials. 13300GJ of energy is saved by repurposing the existing Calvary building. This is equivalent to the energy saved by taking 247 cars off the road for a year. The new Calvary Hospital Bruce outpatient clinic will be a relatively low cost daytime hour service for the public. Outpatient clinics are for patients that do not require overnight hospitalization, and can be for specialized medical services. Since this is a health service for the ACT, the project is fully funded for Calvary by the ACT Health Infrastructure Program (HIP). 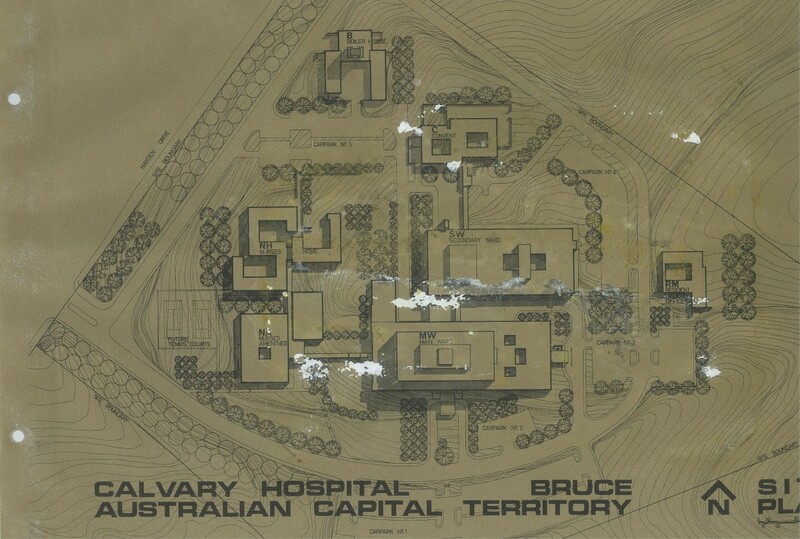 The project began when refurbishments at Canberra hospital meant that there was need to cost effectively extend its outpatient services in North Canberra to the next biggest public hospital, Calvary, which had an unused space available. The chosen building was built in 1978 and was originally a residential accommodation block for nursing staff, classified as a C3 residential building. In 1995 the building became an office but Calvary had not formally changed its classification until now, as the outpatient clinic is an office and professional suite C5 space. 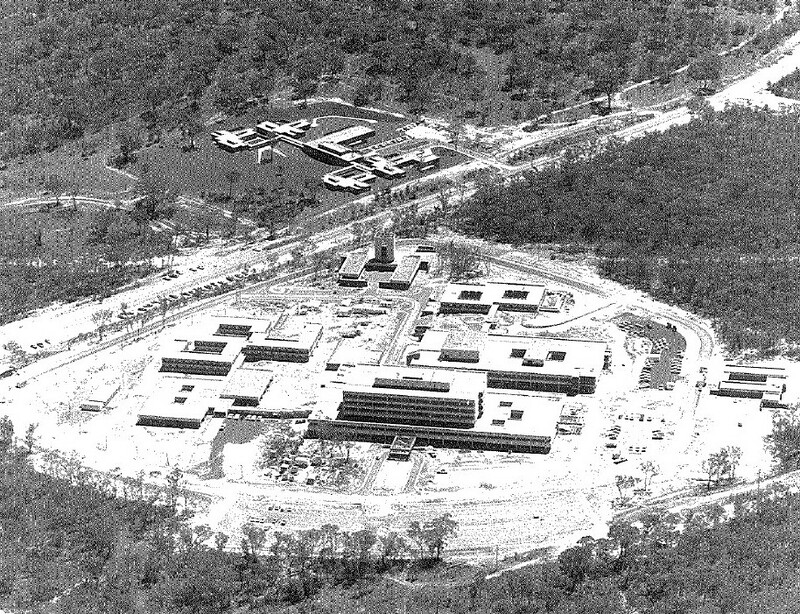 Residence Block under construction 1978. 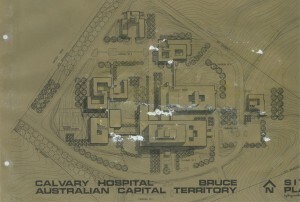 Calvary Hospital Site Plan 1978. Installing energy efficient LED lighting throughout the building. LEDs help to reduce greenhouse gas emissions from power plants by using at least 75% less energy than incandescent light bulbs. 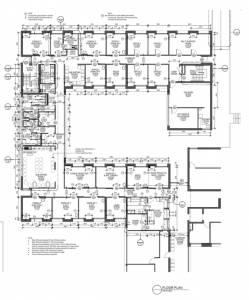 Installing an energy efficient Mitsubishi split system for HVAC with CoP of 3.5 – 3.7. As heating, ventilation and air conditioning accounts for 40% of building energy consumption, this highly efficient system will significantly lower the operational energy of the clinic. Installing customised reception joinery for work health and safety, at access compliant and standup heights. 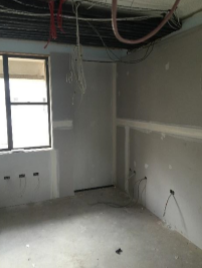 Making structural changes to existing walls, and removal of asbestos. 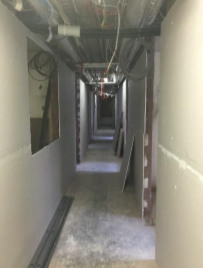 Upgrading the interior spaces to have rubber based flooring, infection control surfaces, enclosed I-beams for less contamination, and resilient finishes. The rubber flooring with low volatile organic compound adhesive is both environmentally friendly, and appropriate for the cleanliness standard required for the hospital space. Currently, the fit out has commenced and all the demolition is completed. 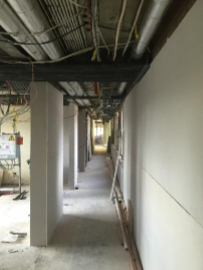 General progress of the corridor and sheeted partition walls of the consult rooms 2016. The cost of refurbishment is approximately 15% less than the cost of constructing a new building. In this particular project the estimated saved cost is $174000. Recycling and repurposing an existing building has a large ecological benefit. Using less energy and minimising the input of new materials releases less CO2 into the atmosphere, and helps to mitigate the causes of climate change. This is also economically sustainable. The outpatient clinic project is an example of BMM achieving its vision for long term sustainable facilities, showing that there is a sustainable alternative to the demolish and rebuild approach. Roussac, C. (2009). Old Star, green star. Architecture Bulletin, Sep/Oct 2009 pp. 14-15. Jackson, M. (2005). Embodied energy and historic preservation: A needed reassessment. Apt Bulletin, 36(4), 47-52. 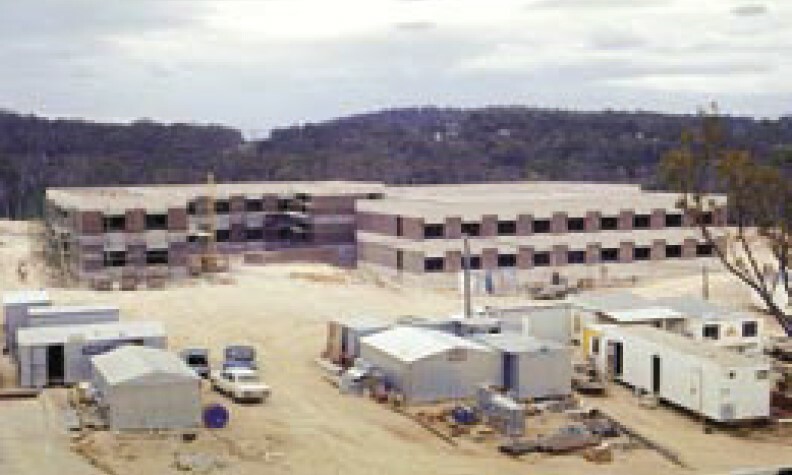 Treloar, G.J., (1996), The Environmental Impact of Construction – A Case Study, Australia and New Zealand Architectural Science Association Monographs, No. 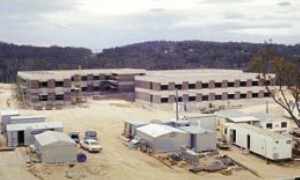 001, Australia and New Zealand Architectural Science Association, Sydney, November, 89. Referenced in Greening the Building Life Cycle: Life cycle assessment tools in building and construction, 2001, RMIT Centre for Design. Available from http://buildlca.rmit.edu.au/. Historic Photographs courtesy of Calvary Healthcare Bruce. The Australian Government, (2016). Department of Energy: LED-lighting. Available from http://energy.gov/energysaver/led-lighting. The Australian Government, (2016). EEX: Heating, Ventilation, and Air Conditioning. Available from http://eex.gov.au/technologies/heating-ventilation-and-air-conditioning/. Current Photographs courtesy of Manteena. Saved аs ɑ favoritе, I like your web site!